Greetings from The 88 Project! We are bringing you news, analysis, and actions regarding human rights and civil society in Vietnam during the week of April 23-29. Environmental activist Hoang Duc Binh’s harsh 14-year sentence was upheld on appeal, and authorities have charged activist Do Cong Duong with “abusing democratic freedoms.” Authorities have also been accused of torturing detained retired teacher and activist Dao Quang Thuc. A female activist was barred from attending a funeral in Nghe An province. Read the second part of our article series with blogger Dieu Cay, ten years after his initial arrest after founding the Freelance Journalist Club and organizing anti-China protests. Read our Editor’s interview with DiaCRITICS about the history and mission of The 88 Project and our thoughts on current human rights issues in Vietnam. Vietnam was recently ranked 175/180 in Reporters Without Border’s 2018 World Press Freedom Index. In the news, read about pleas for ASEAN to address human rights and citizen science at work in Vietnam, as well as takes on Vietnam’s obligations under the Free Trade Agreement with the EU and the continued crackdown on dissent by Vietnamese authorities. Please take action for Hoang Duc Binh and consider volunteering with us! Environmental activist Hoang Duc Binh appealed his 14-year sentence on April 24, but the appeal was denied, and his sentence was upheld by a court in Nghe An province. 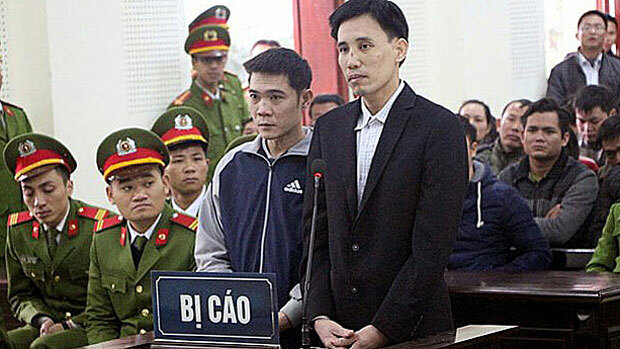 The appeal trial has been criticized for its brevity and the lack of evidence against Binh. Binh is the vice president of the independent Viet Labour Movement and a member of “No-U Saigon,” a soccer group that protests China’s sweeping claims on the South China Sea. He is also a well-known blogger who covered news on the environmental disaster caused by Formosa. According to The Vietnamese, “One of the activities Bình participated in, was to travel with fishermen from Quỳnh Lưu District, Nghệ An Province to the local courts in Hà Tĩnh Province – where Formosa is located – to file their civil suits against the company in February 2017, and the authorities of Nghệ An Province arrested him after that.” Binh has maintained his innocence throughout his detention. Land rights and anti-corruption activist Do Cong Duong has been charged with “abusing democratic freedoms.” Previously, he was charged with “disturbing public order.” Dong was detained in January 2018 after filming a forced eviction. Under the new charge, he faces up to seven years in prison. Authorities have mistreated retired teacher and activist Dao Quang Thuc while in pre-trial detention, his family alleges. This includes denying him proper amounts of food at the beginning of his detention and subjecting him to harsh interrogations. He was recently hospitalized with several health issues. Thuc was arrested in October 2017 on charges of subversion. He was arrested for online postings and peaceful participation in protests over the environment and territorial disputes with China. April 19 marked ten years since former political prisoner & blogger Nguyen Van Hai (Dieu Cay) was arrested. Hai founded the Freelance Journalist Club in 2007, one of the first independent press organizations within the communist regime of Vietnam, to report on controversial social and political issues that state-owned newspapers failed to publish. In a new series of articles for The 88 Project, Hai discusses the past ten years, “the longest trip away from home” in his life, from his arrest in Da Lat city to his current activities in the United States where he’s living in exile, and offers his opinion on the state of the Vietnamese democracy movement today compared to where it was ten years ago. Saigon-based female activist Tran Thu Nguyet was prohibited from attending the funeral of a well-known Catholic priest’s mother in Nghe An. The priest has been involved in seeking compensation for the community after the Formosa environmental disaster. Nguyet was detained and sent back home after landing in Nghe An. Authorities also confiscated and destroyed her cell phone. Our Editor, Huong Nguyen, was recently interviewed by DiaCRITICS about The 88 Project and its history, as well as the state of human rights in Vietnam today and the case of political prisoner Tran Huynh Duy Thuc. Speaking on the current reality of the situation in Vietnam for activists, she says: “As long as Vietnam is still a one-party regime, those advocating for political pluralism will still be harassed and imprisoned and systematic violations of human rights will still occur. And even when there’s political transformation, democratization is not irreversible and human rights protection should be a continuous effort.” Read the full interview here.